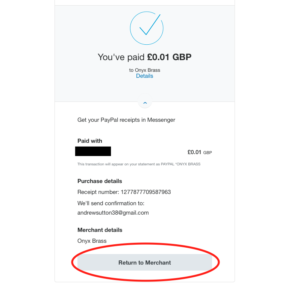 To download a product successfully, once you have paid for your product in PayPal, click Return to Merchant. See below for an example from Safari. 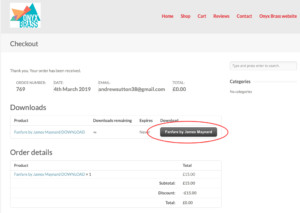 When you return to the checkout page on the website, make sure you click the black and white button link in the Downloads box. See below for examples from iOS and Safari. The file will now download and either automatically open in another window on your browser or preferred PDF viewer, or be saved to your predetermined destination, depending on how you have set up downloads to function on your computer. DO NOT CLICK ON THE BLUE PRODUCT TITLE, it will just return you to the product page and not download your purchase. 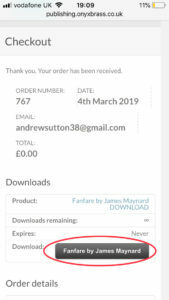 Should you have already accidentally done this, keep clicking back on your browser until you return to the checkout page that looks similar to the above images and follow the above instructions. We are sorry it’s not clearer but we are using a template so unfortunately this is how it renders. Any tips on how we could make this better would be gratefully received. Our software is WordPress/WooCommerce.